So in other words, these are built to an environmental specification that gives us confidence in the ability of the optic to hold up under the specific testing of MIL-STD-810. Think of this as a basic pedigree under which these optics can attest to their durability. This is exciting news as this gives the shooter a new optical product held to a standard of quality above the low end Chinese imports. Best of all? The price. Primary Arms lists the RV-1 for $219 dollars which is currently sold out. This optic looks like the equivalent of an AIMPOINT COMP-M4 without the high price. I emailed DI Optical for a test sample so we can get some pics up close and personal of this product, so let’s see if they send me something to examine. 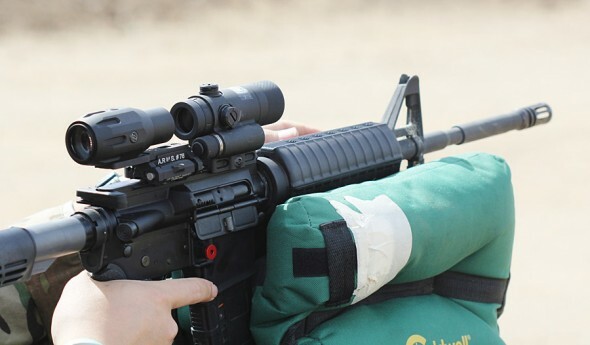 They have a variety of interesting red dot designs on the rifle end, as well as a tempting machine gun optic with a quick range dial integrated into the optic. Hopefully they are giving the American shooter something that’s a reliable “working mans” RDS that won’t send us into crippling debt. Keep an eye out for DI Optical in the future.